Lemons may make you shiver with their bitter taste, but this little stress lemon will keep you in a good mood all day. Bash it, smash it, squeeze it and get rid of all your frustrations and pent up anger. This is a great anger management tool for use in the office, at home, at college or in the car while stuck in traffic. Add a fun and fresh element to your company image when you brand these lemons with your personalised logo and graphics. Also consider other citrus fruit themed stress shapes like our personalised stress ball oranges. Our listed price includes branding of your logo or graphic in a single colour print. The process is simple and fast, we offer a product turnaround time of two weeks, but we can offer even faster turnaround times for urgent orders. Please note that our prices exclude GST and a print set up of $75 applies. Stress toys make great freebies at expos, product launches, trade shows and corporate events. Your clients will always have your company image close at hand and in sight when they keep the lemons on their desks as office ornaments. Our stress toys are manufactured from a strong and durable material that is pliable and will spring back to its original shape, no matter how much strain they take. 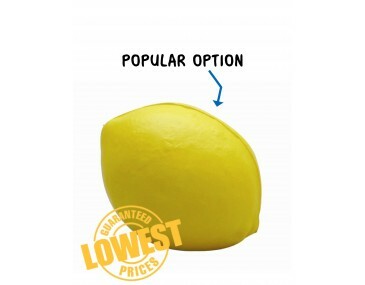 Our lemon has a three-dimensional design with a bright sunny colour and an oval shape. The rough texture of the outer covering add to its authentic feeling. Fresh produce markets, fruit and vegetable stores, fresh fruit juice outlets and businesses in the food sector can make great use of these trendy toys.